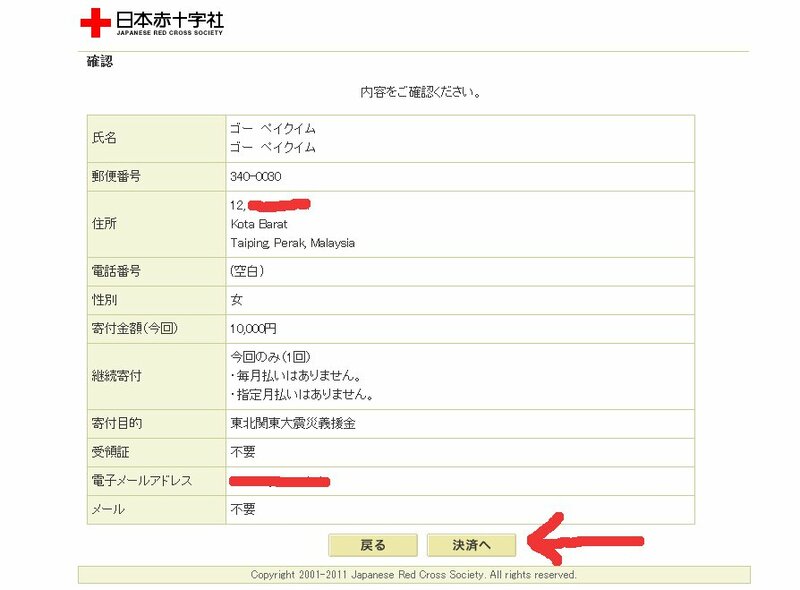 For those who wishes to donate to the relief efforts in Japan, here are 2 organizations which I think we should support. 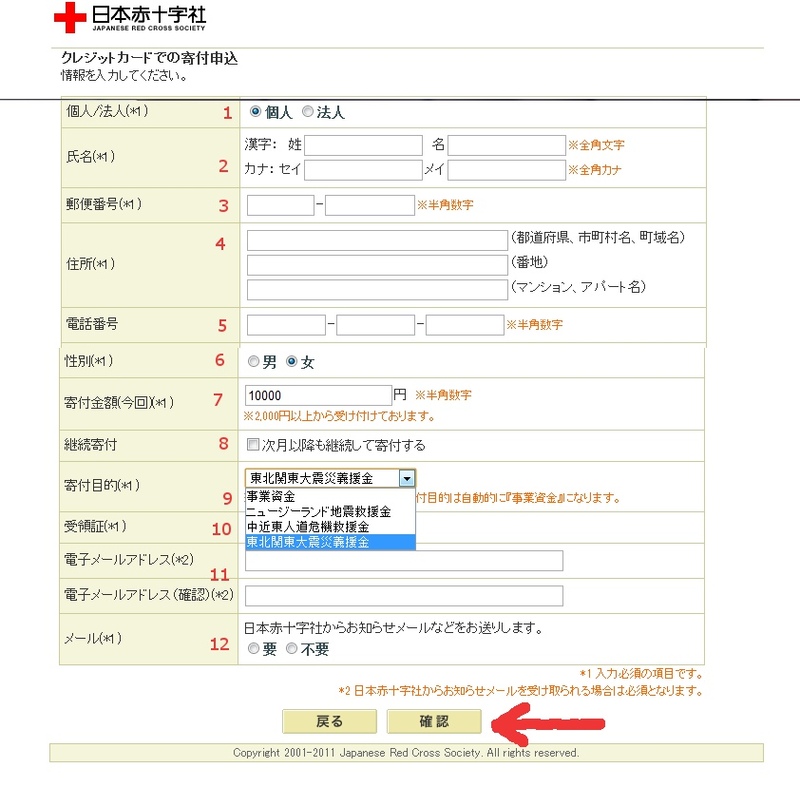 Quick note: Personally I prefer to donate directly to the authorities in Japan, instead of going through any other intermediaries to ensure that my donation ACTUALLY reach those in need and not lost in webs of bureaucracy or being eaten up by administrative charges. They accept unrestricted donations so you are donating to a common fund. Check out the link here. 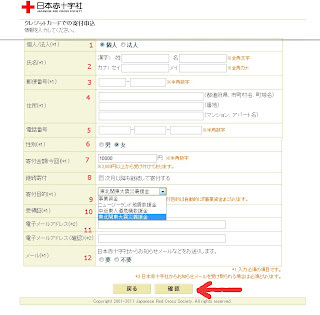 This option was given in their Japanese language site, but not their English site. So I've done some screen captures to help those who wish to use their credit cards to donate. 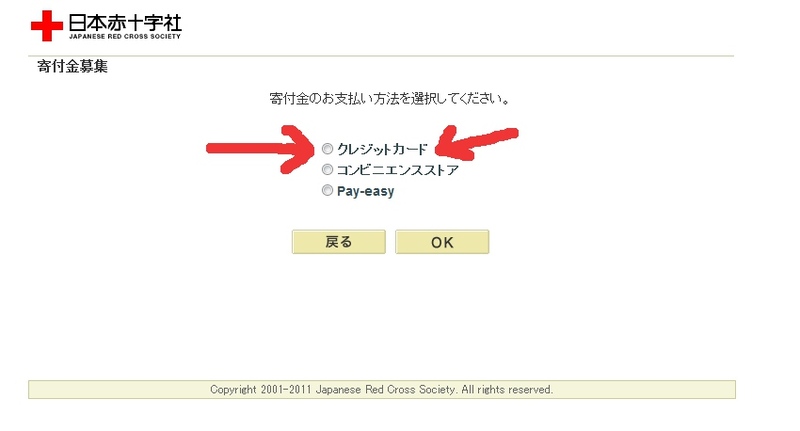 Please note that the minimum donation is 2000yen, which is around MYR$76 / SGD$32 / USD$25. Disclaimer: I am just providing a guide and shall not be responsible for any errors or problems you might encountered while making donation. Please do not ask me about your bank or credit card questions/issues. 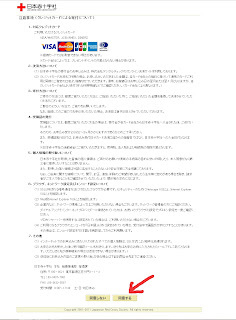 Page 01 - Choose the first option ｸﾚｼﾞｯﾄｶｰﾄﾞ (credit card). Click "OK". Page 02 - The usual disclaimer, terms and conditions. Just go to the end of the page and click on 同意する (which means 'I Agree'). Page 03 - This is one of the more complicated pages. Let me guide you through. 1 -> 個人(Personal) or 法人 (Company). 2 -> Fill in your name. This is the most tricky part. You can either use IME or use google translator to translate your name into katagana. 3 -> Postal code. If you are outside Japan, just key in any 3 digit (in e first box) and any 4 digit (in e 2nd box). 4 -> Address. You can put in your address in English. 5 -> Your contact number. Not compulsory. 6 -> 男 (Male) or 女 (Female). 7 -> Your donation amount. Minimum amount of ￥2000 . 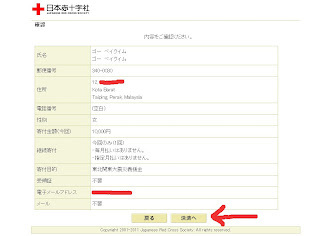 8 -> Do not check this box unless you wish to maintain a monthly donation. 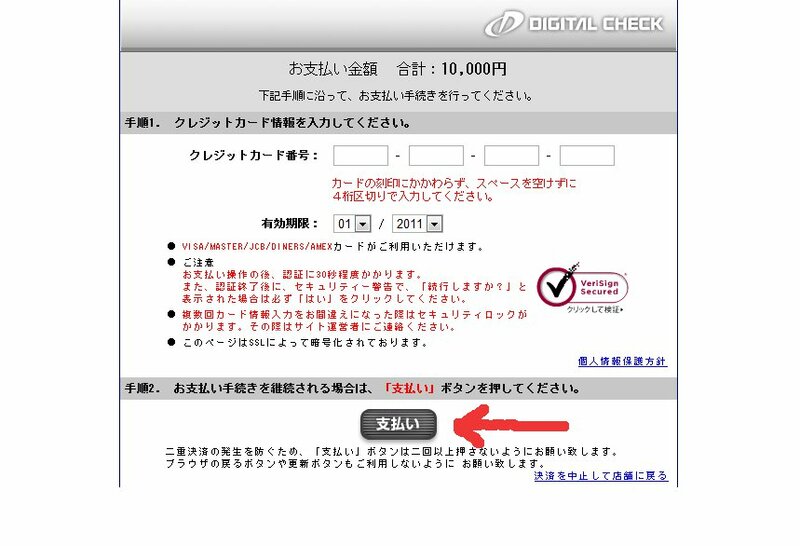 9 -> Click and select 東北関東大震災義援金. 11 -> Your email address. Fill in twice. 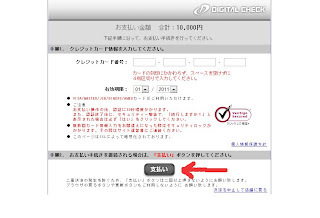 Then click on 確認 (Confirm). Page 04 - This is a summary page of the details that you've keyed in. Once you've checked and satisfied with it, click on 決済へ (To Payment). Page 05 - Payment page where you key in your credit card numbers and expiration date. 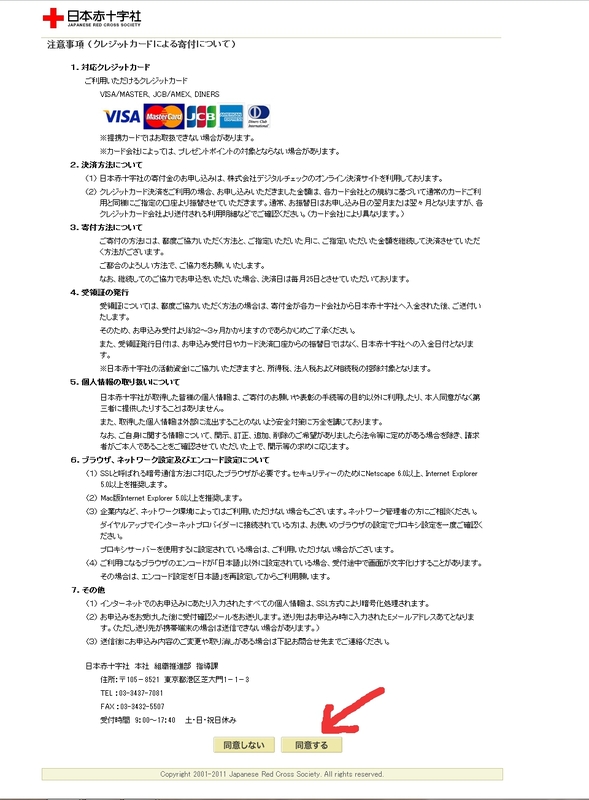 Once done, click on 支払い (Payment). Once clicked, payment will be processed. 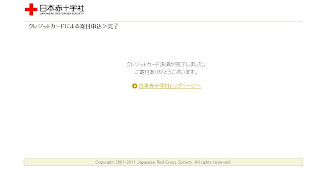 Page 06 - Your credit card has been charged and The Japanese Red Cross Society thank you for your kind donation! :) You will also receive an email acknowledgement for your donation. Note: I've donated through their website using my SG credit card while doing the screen capture. The amount is yet to be charged to my credit card, thus I cannot confirm if they've received my money. Shall update once confirmed. 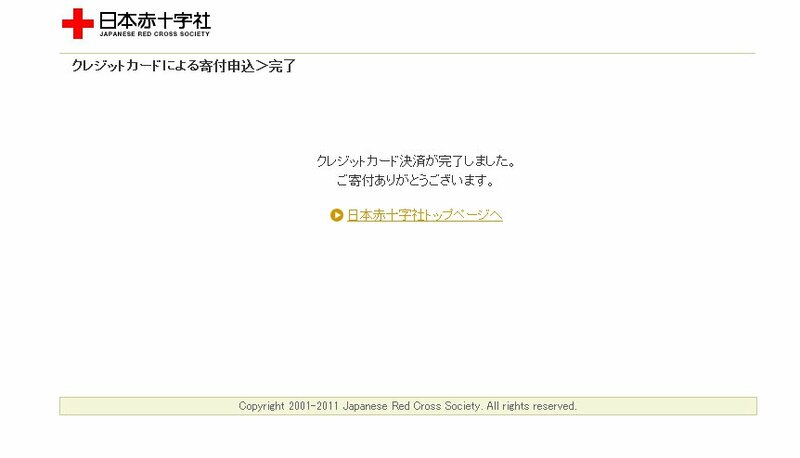 Update on 04 Apr: My credit card was charged correctly by the Japanese Red Cross Society. For those in the US, here is a list of organizations you can donate to. Anyone is welcome to link to this page. Every single dollar helps. Thanks! !